In a large frying pan, heat the oil over moderately low heat. Add the onion and cook, stirring occasionally, until translucent, about 5 minutes. Add the fennel seeds, the orange zest, and the salt and pepper. Cook, stirring, for 1 minute longer. Add the tomatoes and simmer, covered, for 10 minutes. 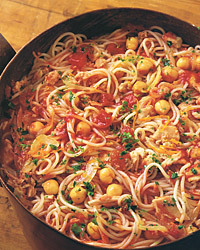 Add the tuna and its oil and the chickpeas, cover, and remove the pan from the heat. In a large pot of boiling, salted water, cook the fedelini until just done, about 6 minutes. Reserve about 1/2 cup of the pasta water. Drain the pasta and toss with the sauce, 1/4 cup of the reserved pasta water, and the parsley. If the sauce seems too thick, add more of the reserved pasta water. Canned Tuna Different brands of tuna vary tremendously. Here we use tuna packed in oil, and we count on that oil as part of the sauce. If your tuna has less than 1 1/2 tablespoons oil per can, add a little extra cooking oil to make up for the difference. Wine with plenty of acidity will stand up to the fennel and tuna. A bottle of either Sancerre from the Loire Valley in France or Sauvignon Blanc from California will do nicely.